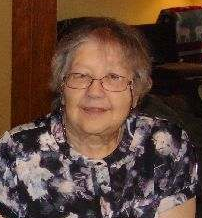 Beverly Louise (Corwin) Glass, 77, of Lyons, passed away August 29, 2018 at Wesley Medical Center, Wichita, Kansas. She was born September 18, 1940 in Elko, Nevada, the daughter of Glenn and Mildred Davenport Corwin. Beverly attended Sterling High School for most of her high school education, and graduated from Lyons High School with the class of 1958. She was a near lifelong Lyons resident. Beverly owned and operated Bev’s Beauties in Lyons for many years, prior to that she worked as a pet groomer for Ark Veterinary Clinic in Sterling. She enjoyed Elvis, family gatherings, Facebook, Kansas City Royals, and grooming pets. Beverly was a member of VFW Women’s Auxiliary. On June 3, 1974, Beverly was united in marriage with Ralph Glass in Great Bend, Kansas. He survives of the home. She is also survived by her four children, Rena Billington (Randy Billington) of Lyons, Roma Brown (Ken Brown) of Lyons, Ray Ross (Donna Ross) of Choctaw, Oklahoma, and Brandon Glass of Lyons; six step children; sixteen grandchildren; seventeen great grandchildren; two brothers, Ron Corwin (Teresa Corwin) of Hutchinson, Don Corwin (Patricia Corwin) of Sterling; and one sister, Joyce Regehr (Jim Regehr) of Corpus Christi, Texas. She was preceded in death by her parents; son, Russel Ross; and stepdaughter, Diane Glass. Funeral service will be 10:30 A.M., Saturday, September 15, 2018 at Birzer Funeral Home, Lyons with Rev. Robert Friesen officiating. Burial will be at Lyons Municipal Cemetery. Memorials can be made to Friends of Animals Rice County in care of Birzer Funeral Home, Lyons.